Nikki was based at the University of Bristol for over 10 years. In May 2015 she moved to a new role – Senior Enterprise Architect at the University of the West of England. In her former career, Nikki was a Mathematics Teacher. 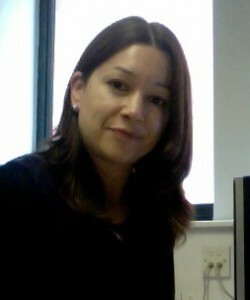 She successfully completed an MSc in Computer Science at the University of Bristol in 1999 and developed her IT career from there. Initially a Java Web Developer, Nikki went on to become Web Futures Manager in the R&D wing of IT Services. There she had responsibility for bringing in innovative technology projects to help transform the way research and learning is carried out. Her favourite final offering to that role was to bring about a project in collaboration with Biological Sciences at the University – a project that successfully delivered crowd-sourcing, mobile tools to help researchers to track and monitor the progress of the Conker Tree Leaf disease in the UK (http://leafwatch.naturelocator.org/). In 2010 the University, IT Services decided that the University needed to embed formal Enterprise Architecture approaches within the institution. Enterprise Architecture is a well-established profession with its own formal methodology and the specific goal of enabling complex organisations to have greater agility in achieving strategic change; it was recognised that IT has an important part to play in almost all areas of activity within the University. Therefore the new role of Enterprise Architect was created at Bristol in 2011 and Nikki was recruited as Bristol’s first Enterprise Architect. I find your blog very interesting and enjoy reading how you are proceeding with your EA initiative over time. Would be great, if you could make it.